changing her from an original form. where the fever coats her in thick paint. his ear, and those prehistoric sunflowers. gives her reasons to fight. and the pastel capillaries of Amsterdam. one that frees the brain from feverish paint. how far away from his life he really is. Copyright 2009, Amy Nawrocki. © This work is protected under the U.S. copyright laws. It may not be reproduced, reprinted, reused, or altered without the expressed written permission of the author. 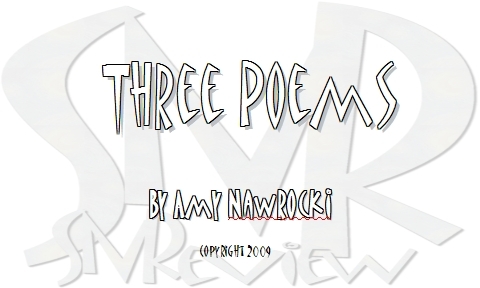 Amy Nawrocki teaches English and Creative Writing at the University of Bridgeport. Her chapbook Potato Eaters, which was a finalist for the 2007 Codhill Press Poetry Chapbook Competition, is currently available from Finishing Line Press. She won the 2008 Writing Contest from The Litchfield Review and has been awarded Honorable Mentions from the Connecticut Poetry Society and New Millennium Writings.